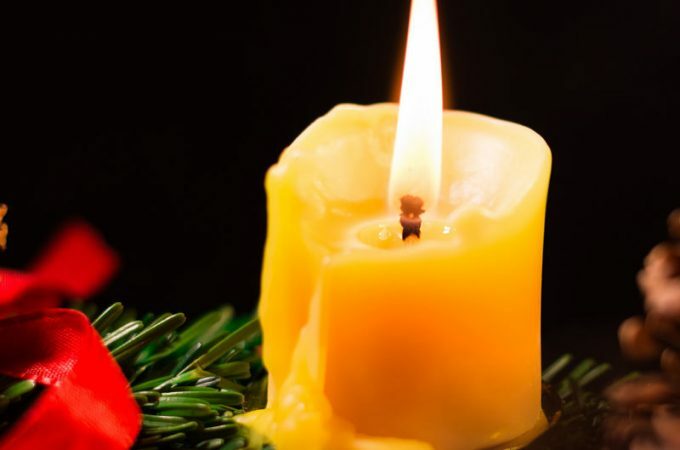 I love all the little rituals of Christmas don’t you? 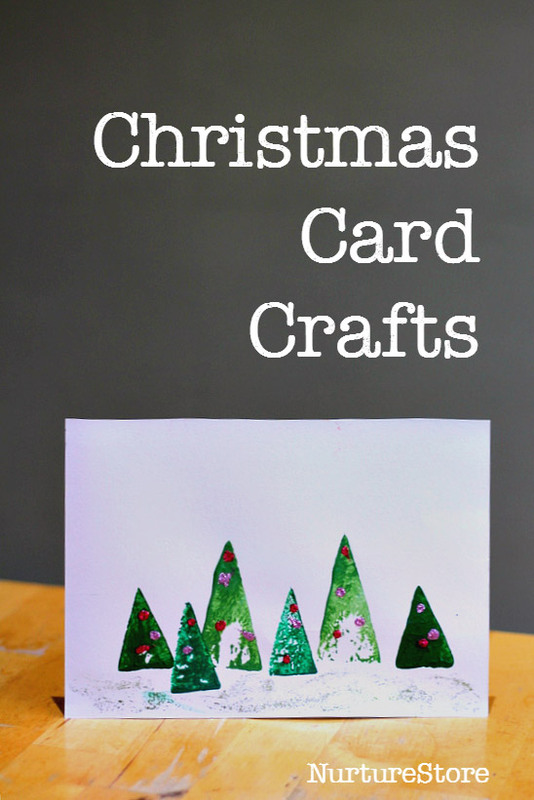 One of my favourites is making Christmas cards. Nothing fancy. We’re not that crafty. Just simple stuff we can make with supplies we’ve got in the house. 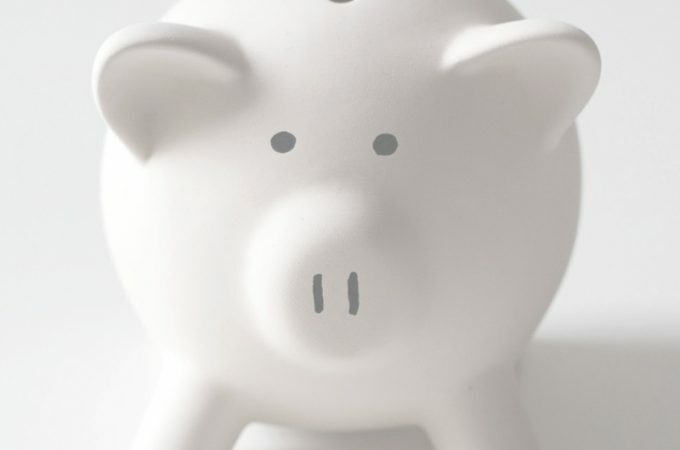 On one of those grey winter days when it really is too wet to go outside – even for us! 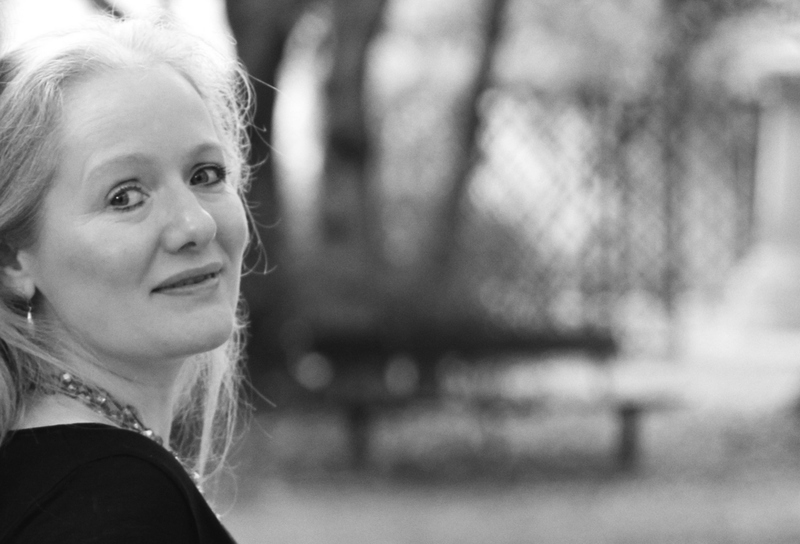 And we come back – over and over – to the same lovely old ideas. Potato prints. Finger prints. Hand and feet prints. But that’s what Christmas is about isn’t it …? … all those little traditions are what makes it special. Especially for kids. 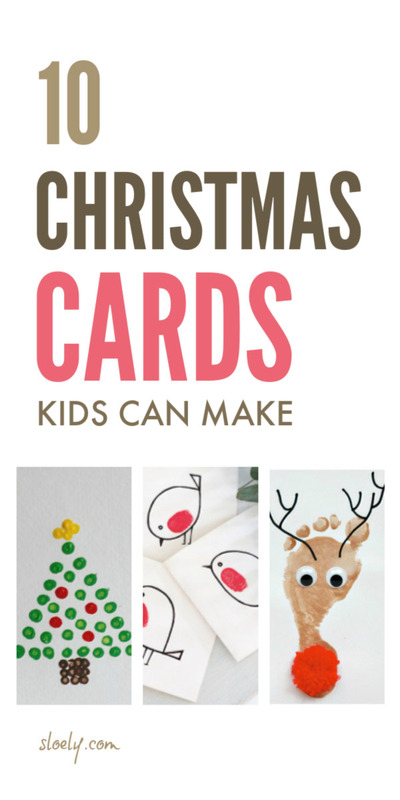 So here are some of our favourite super simple Christmas cards kids can make themselves. AND they’ll be happy to make again. Year after year. 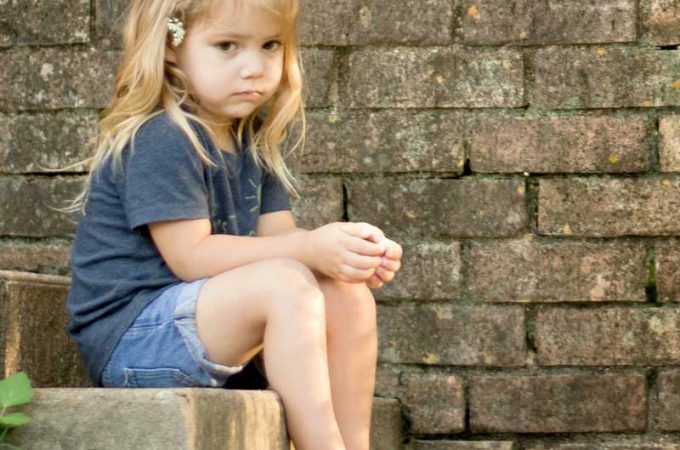 Even when they reach the grand old age of 7. Or – oh my goodness! – 9! I hope you have as much fun making them as we do. 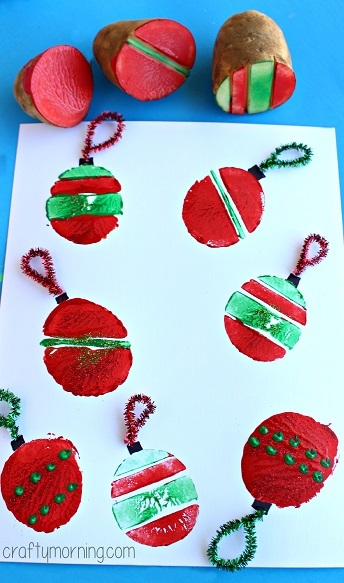 You can’t get simpler than these potato print baubles from Crafty Morning. 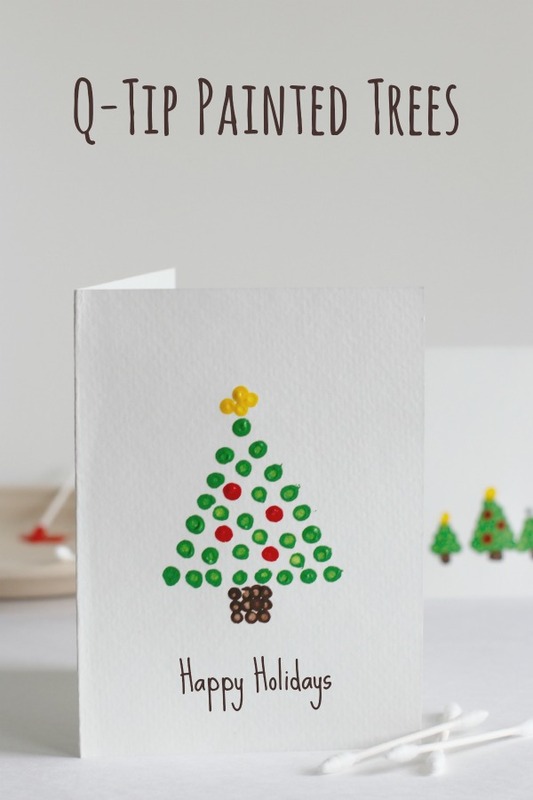 And I just love these potato print Christmas tree cards from Nurture Store – beautifully simple with nothing more than some green paint and a few sparkles. 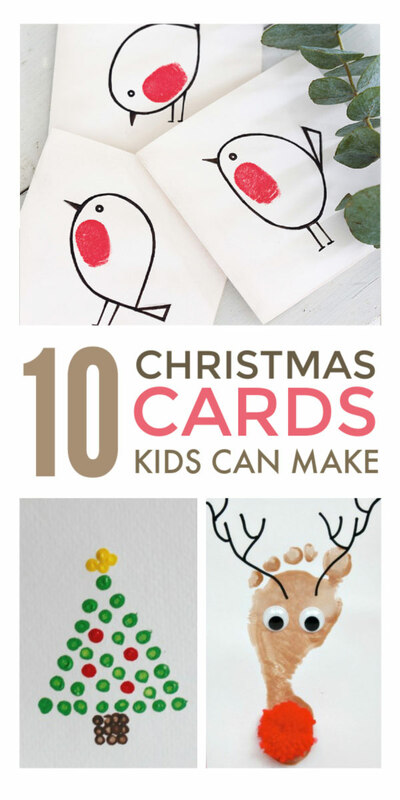 Little finger prints can be turned into everything from elves to Rudolf with the help of a sharpie. But aren’t these robins from Rylands, Peters & Small the cutest? 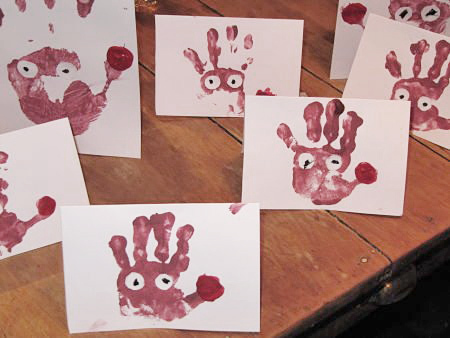 We’ve been making these Rudolf handprint Christmas cards since my daughter was tiny. 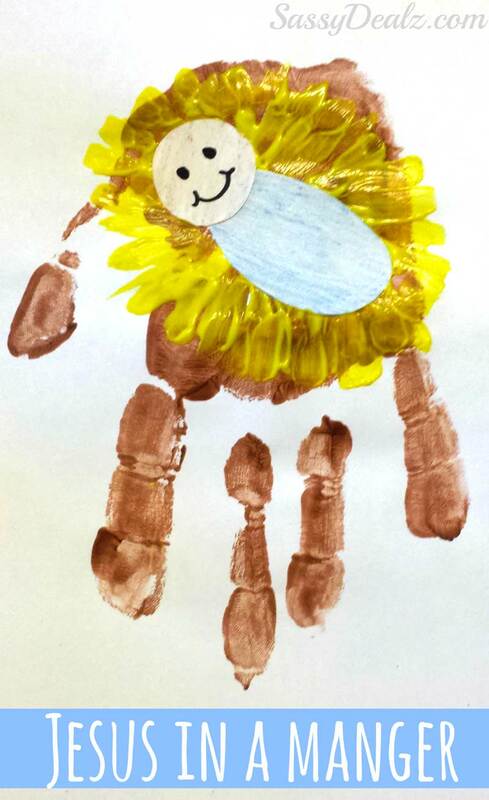 But even older kids can enjoy making handprints cards like this fab manger from Crafty Morning. 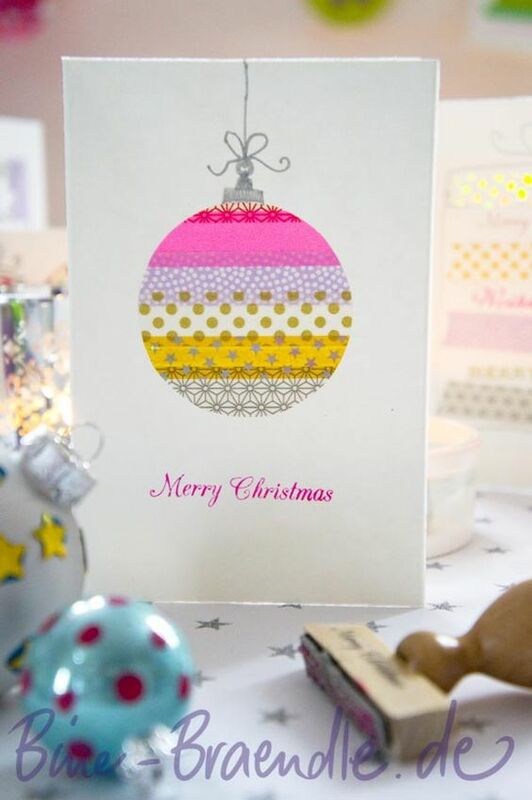 And if you’ve got the mental energy for some real mess, make Rudolf foot print cards like these from Emma Owl – I love the pom pom nose! 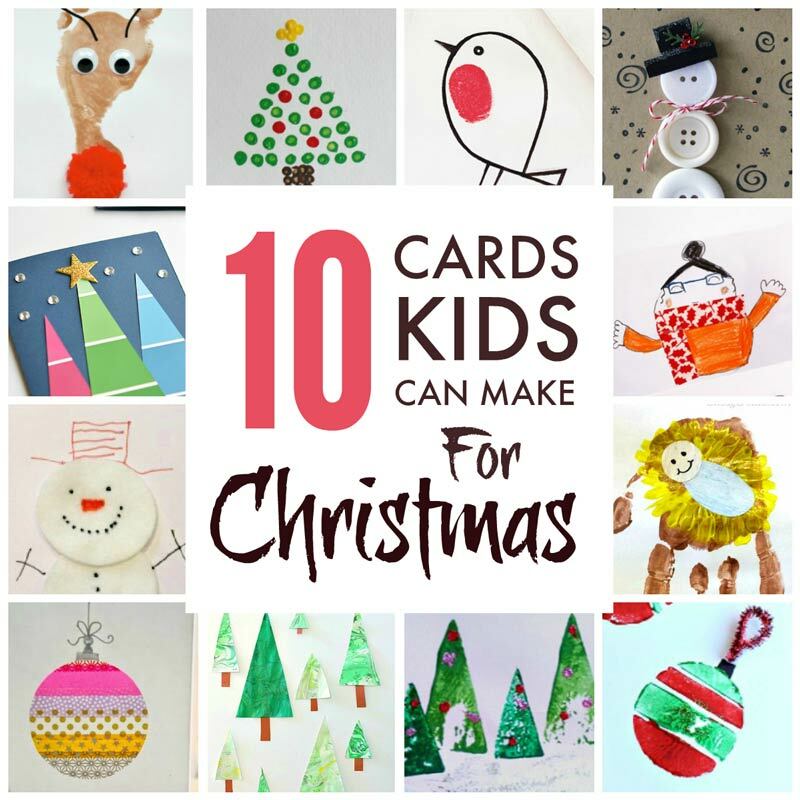 Just remember with these – and the finger print and hand print Christmas cards – to leave them to dry before adding extras. Some of ours have ended very splodgy because little fingers were just so impatient to stick stuff on! 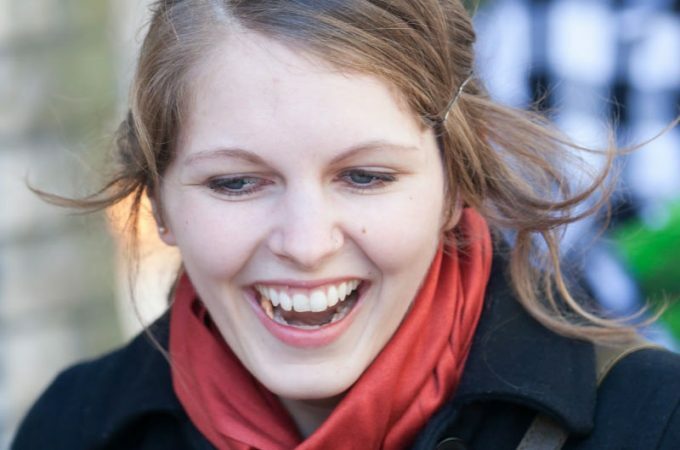 BUT if you’ve NOT got the energy for wet paint everywhere – heh, that’s allowed! 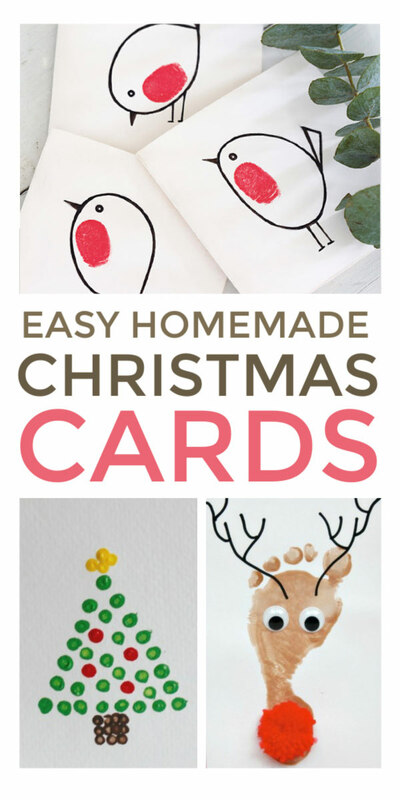 – these paint chip christmas cards from One Little Project are for you! Just grab some samples from your local hardware store. Cut and stick! 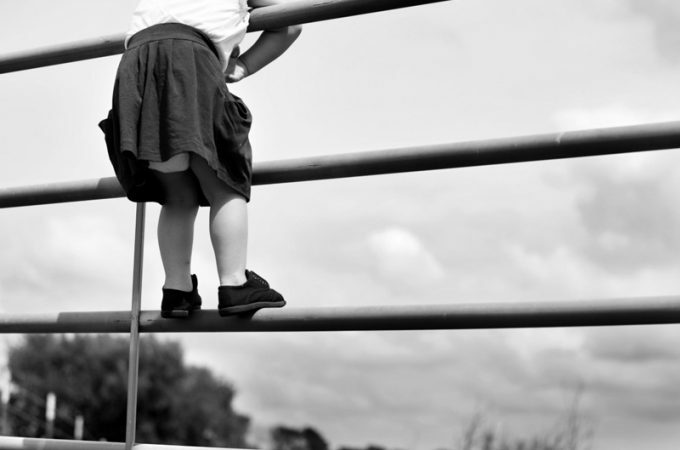 If you’re looking for more fine motor activities do check out all the lovely ideas here. Buttons are another of our big Christmas faves. 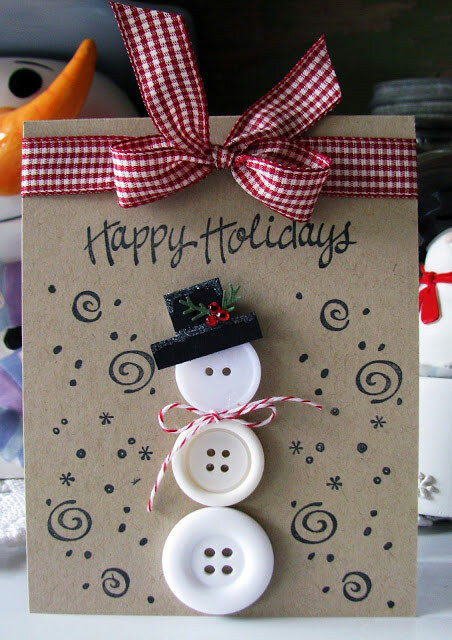 And these button snowman Christmas cards from Dee Dee Campbell are adorable. So washi tape – just in case you’ve not discovered it – is the best friend ever of tired AND not very crafty mothers! It’s my fall back for easy Christmas decorations every year. 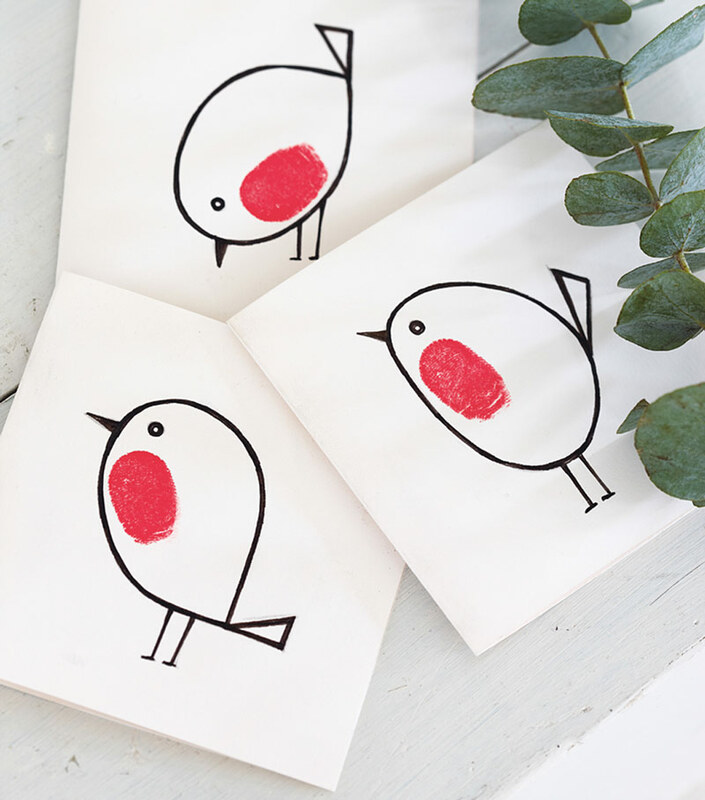 And we always make these simple washi tape Christmas cards inspired by Bine Brandle. 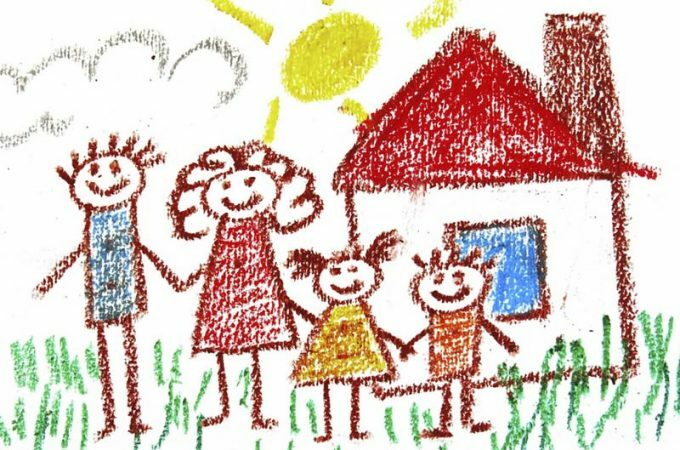 But my almost 8 year old – who draws better than her mum! 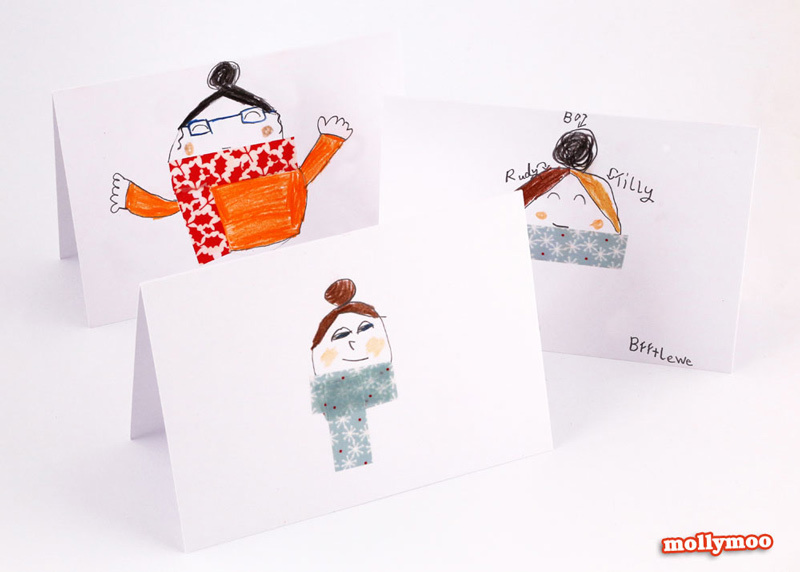 – is super excited about trying these this year from Molly Moo Crafts … aren’t they cool? 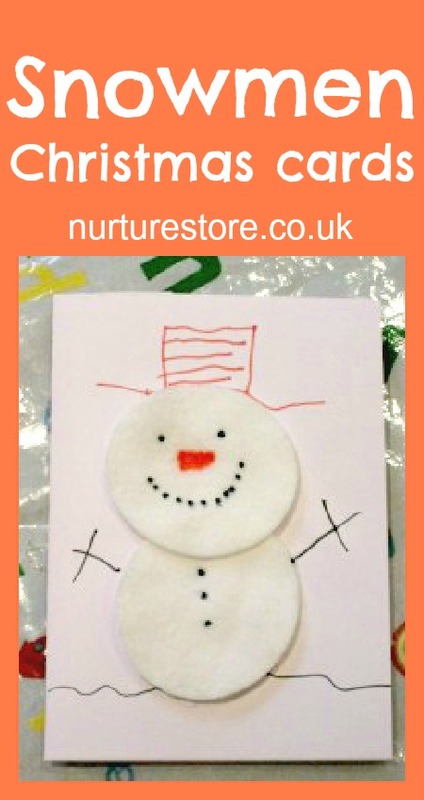 These cotton wool snowman Christmas cards from Nurture Store take me back. I used to make ones just like them with my mum. I think she might even have one still in her loft! 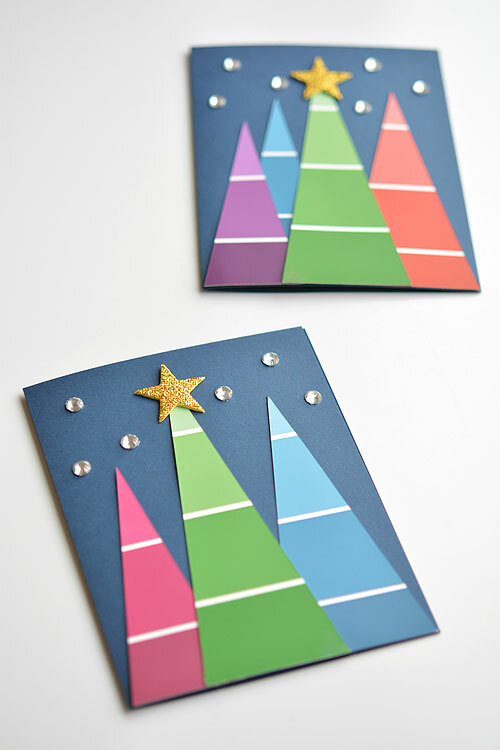 My final simple Christmas card kids can make are these lovely trees from Buggy and Buddy. Now her version does involve marble painting which is a lovely activity for a soggy afternoon. But if time and inspiration fails you, you could always just cut up all those scraps of gift wrap you’ve been saving since last Christmas! 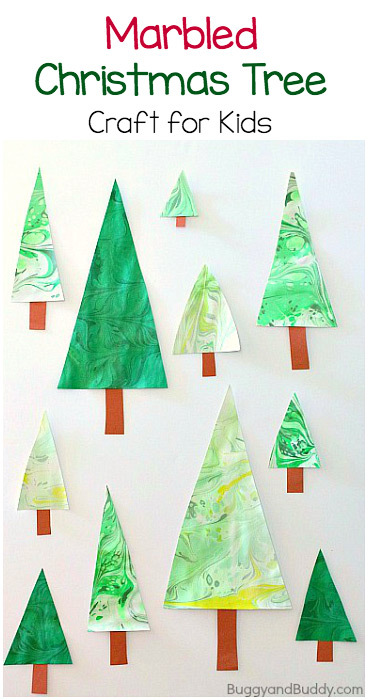 It’s a fab way to use up that paper on Christmas cards even the littlest of kids will love making. I do hope you enjoy these. 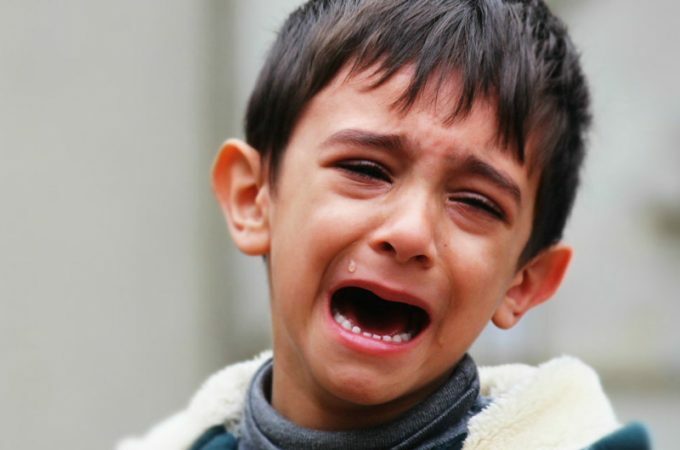 Do come back and let me know what your kids make.